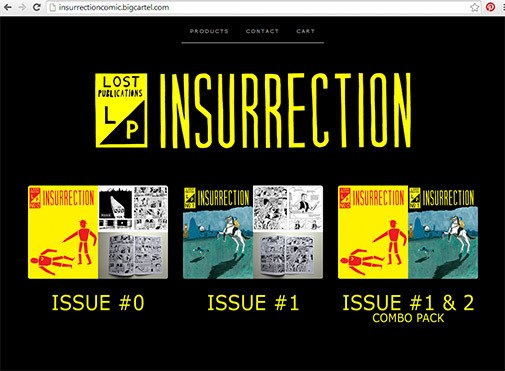 As the early stages of my promo push surrounding the new issue of Insurrection due soon (previews to come) I’ve (finally) set up a store front for Insurrection. No longer is it a convention or Sheffield comic shop exclusive! You can either use the link at the top of the page or go here. Happy Shopping! 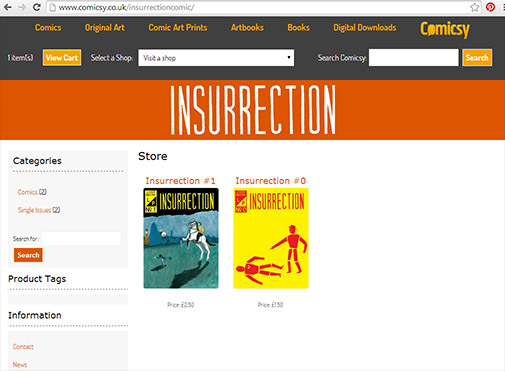 I’ve also set up a Comicsy store for them too! If anyone experiences issues with either of these, please drop me a line and I’ll do my best to sort it out. 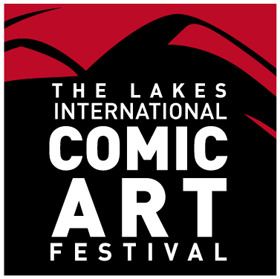 I’ve got a table at The Lakes International Comic Art Festival which runs from the 17th – 19th of October. I’ll be part of the Comics Clock Tower, alongside a raft of great British comic talent, take a look at the site to find out who (I’m on this page). 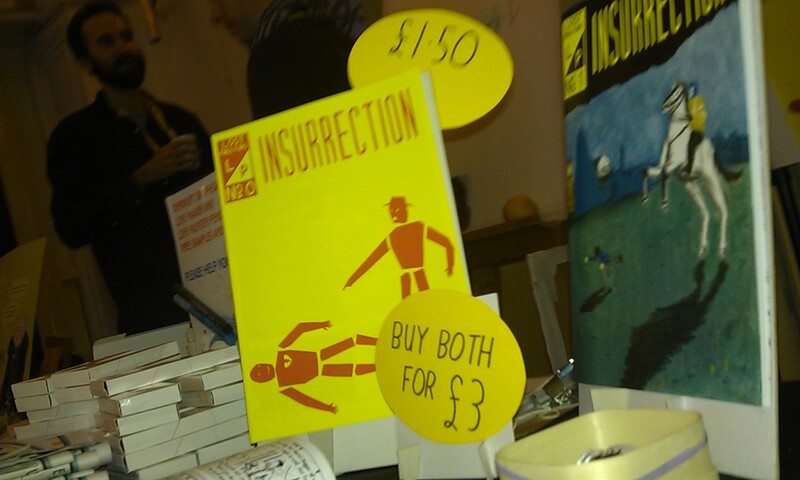 I was at Sheffield Zine Fest over the weekend. I had my stuff on the shared table as I couldn’t do a full day and consequently it was the first time I’d displayed without my full set up. Normally I layout a table with a banner behind and more importantly original artwork on the table for people to peruse. I find this is a great way of drawing attention as there’s something very authentic about seeing the original art, warts and all, before it gets cleaned up for the final print. The other eye-catching feature of it is that it is HUGE. Each page is drawn on an A2 sheet, taking up about 2/3 of it. This is because I want the comic to be pretty detailed, and whilst it’s a little larger than it needs to be, it really helps making the final comic look dense and more alive. 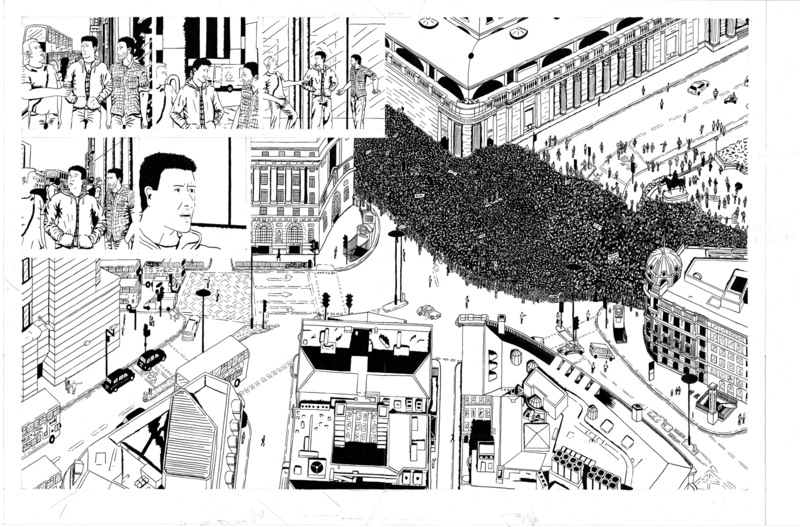 Especially the crowd scenes, which I’m really pleased with. Since drawing the comic is a real pleasure for me, I like to do it manually as much as possible. I ink using a dip pen and a brush for the larger areas. This can be a very slow process, I did do a test using purely digital inking and it wasn’t that much faster but definitely less fun. Also there is a great pleasure in seeing parts of the page become black, and patterns emerge. 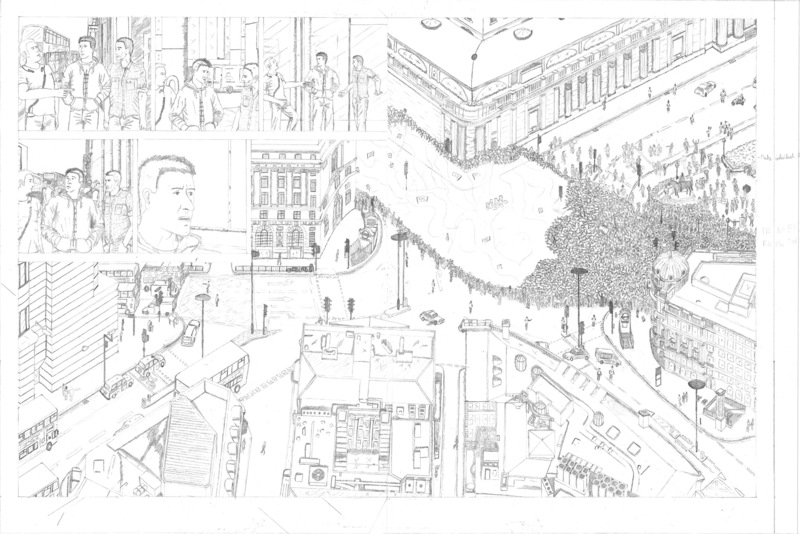 This means most of the pages are fully pencilled out and a lot of work goes into making each page. As proof, here’s the evolution of the demonstration title page spread from issue 1. This image is actually A1 size, as it’s two sheets taped together. This spread took absolutely ages to draw (about three months of evening where I could get them), I spent a lot of time squinting over Google maps and using Street View. The setting is the junction outside the Bank of England – it’s the building at the top right. I also try and get good references for cars and things to make everything feel real. 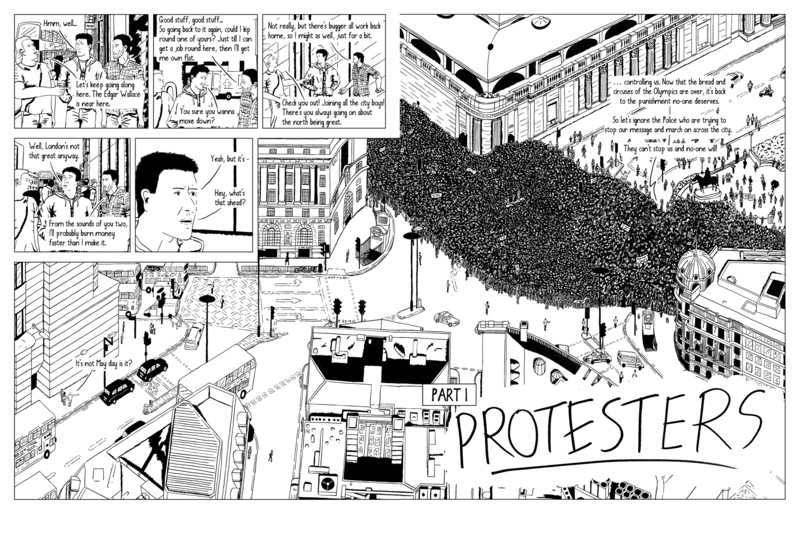 There’s was only one concession for time, I didn’t bother sketching all the protesters till the inking stage – there’s not any great detail to miss. Try looking for the four horsemen of the apocalypse – I copied them from a real protest. Next comes the inking. This takes less time than the pencilling and I really enjoy inking. It’s a bit like playig with a colouring book of your own work. Most of the inking decisions I’ve already made at the pencilling stage and written notes about on the margins, there was about 5 months between drawing and inking. This is one of the joys of doing a large project in your spare time, you have to have a lot of patience with yourself. I’ve actually inked in the whole crowd this time, whilst the thought of using Photoshop’s clone tool did cross my mind, the result is better without. The page is largely finished now, I try and get the inks to look as good as possible and save the digital parts to minimal cleaning up. Here is the final page! I’ve cleaned up the image, removing any obstinate pencil marks that refused to be erased and sorted the levels to remove any grey. Most noticeably I’ve added panels borders and dialogue. I like panels borders for the construction they give the page. With Insurrection I’m trying not to use speech bubbles as I feel their use has become too automated in current comics. They tend to normally be perfectly computer generated ovals, filled with computer sanitised fonts and as a result feel lifeless. There’s an energy to hand drawn bubbles. Anyway – away from my high horse, I’m working on a style I first saw in the Adventures of Luther Arkwright, which is to make a space for the text and use a line to indicate who is saying it. I try and make the space feel natural in the art by rounding of all black areas it cuts into – rather than have a Photoshop generated mask, making it feel like the text is supposed to be there, it’s all part of the same world. I’m interested to know if anyone picked up on this and what they thought. This has left me with an issue in representing different types of communication, such as loudspeakers and thoughts, but it’s always a challenge. The text is written in a font based on my own handwriting. After my rant about the fakeness of CGI bubbles it might seem a little shallow to use a font, but this is where practicalities come into play. If it was hand written it would take much longer to make sure I didn’t make mistakes, and get the spacing right. I’d probably end up spending my time cutting out each letter and re-spacing it. The font is mine and my hand – improved to make it more legible! So there it is, that’s how I make a page, I’ll take original art to most of the events I go to, please come along and have a look! Hello, I’ve not posted on here for a while – just to let you know that I’m still working behind the scenes on the next issue. I’ve been held up by moving house and having a new addition to the family, which is great! 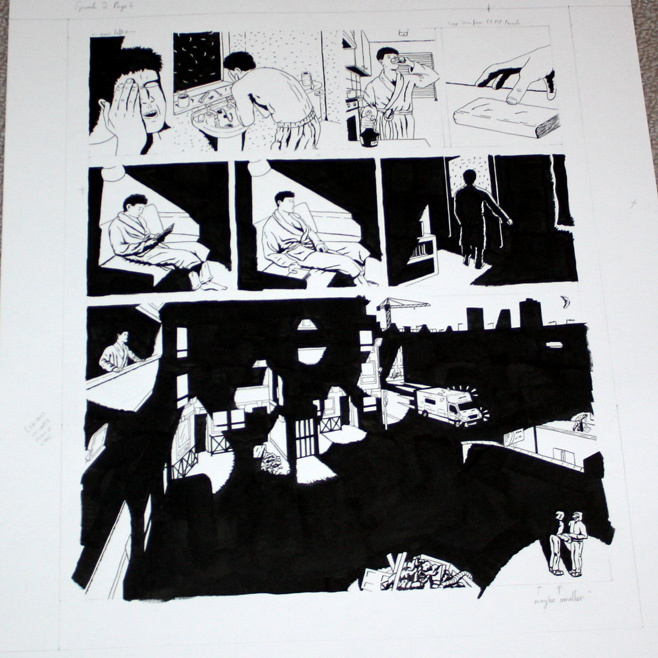 Still I’m continuing on – just to prove it, here’s a page from the next issue inked and ready for scanning and lettering. Looking forward to showing the new stuff soon! Hello, here’s another update on Insurrection! I had to pull out from going to the Bristol Comic Expo, which I did because I’ve had a bit of a change in my life recently which is delaying issue 2 amongst other things. 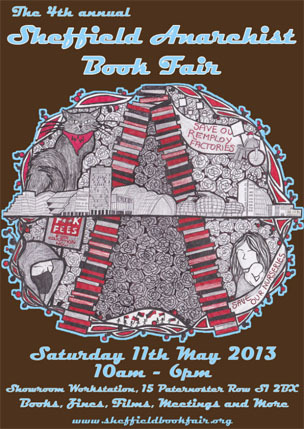 Instead I turned my attention to another more local convention – The Sheffield Anarchist Bookfair. This was an excellent chance to reach out to the more political side of the comic and see how it faired. 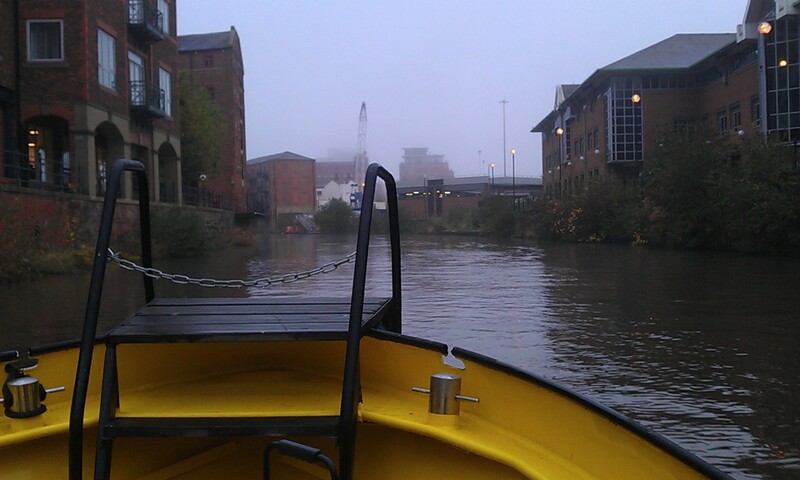 I had an great day there and met some really interesting people. Thanks to all those who came up and chatted. As I mentioned above progress on the next issue has been delayed, which means I’ll slip on my original May goal. Work is continuing on it though and I’ll keep this site updated. I’m a big fan of comics from the the continent and it’s great that more and more of them are finally becoming available in English. It seems to have a been a process happening in spurts and we’re currently going through another phase thanks to the always excellent Cinebook, and my new favourites Fantagraphics (new to me anyway), amongst others. Finally, apologies to William Morris for ‘borrowing’ the title of one of his most famous works for the post title. Updates, Zine Fest, BAFTA and games! 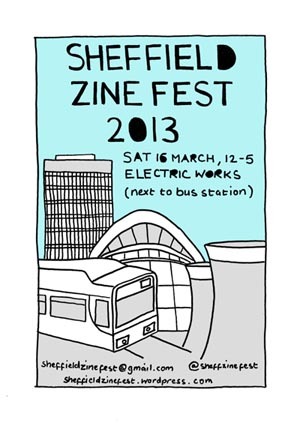 Hello, just a quick update to say that this weekend (16th of March) I’ll have a stall in my home town of Sheffield at The Sheffield Zine Fest. It’s at the Electric Works in Sheffield, which is the new (ish) building in between the train station and the bus station – which also happens to be the place I work (no direct connection between the two). Come along and say hi, there looks like a good collection and local stuff! I’ll be selling copies of Insurrection and will bring along the pencils for the next issue, which should be hitting the press around May time. Production has been slow, which is frankly because I draw very slowly. Several people have noted how detailed the panels were, and that takes long process. I’ve thought about cutting down on the background details – but bah! It just wouldn’t be as much fun without it. It does seem likely as my May deadline approaches I will probably go into some kind of meltdown though, hey ho. Another excuse reason for the slow progress (and not many updates to this site) is that the comic is very much a spare time obsession. During the daylight hours I don another hat, that of Lead Developer at the lovely little Sheffield games company Team Cooper (based in the electric works, as mentioned above). This means that during the day I get to think up and make ‘digital amusements’ one of which was recently nominated for a BAFTA, yes a real live BAFTA! This is huge news for us and something I’m immensely proud of, having put in a lot of effort last summer (very nearly not having anything ready for Thought Bubble) to pull off the BAFTA nominated Hoopla! 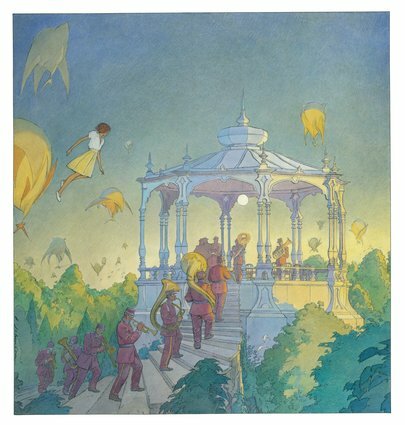 Go and have a play – you might like it! 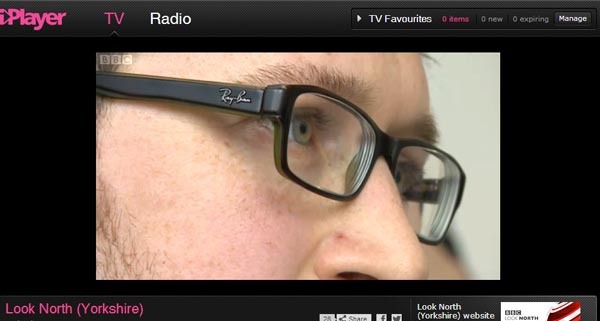 It was also very fun as I got to appear on BBC regional news – or more specifically, my glasses made a star appearance. Not only that but I’ve also had a little tidal wave of good news as the project I produced after completing Hoopla has now gone live. Are you a fan of retro sci-fi, aliens, Zelda type games? 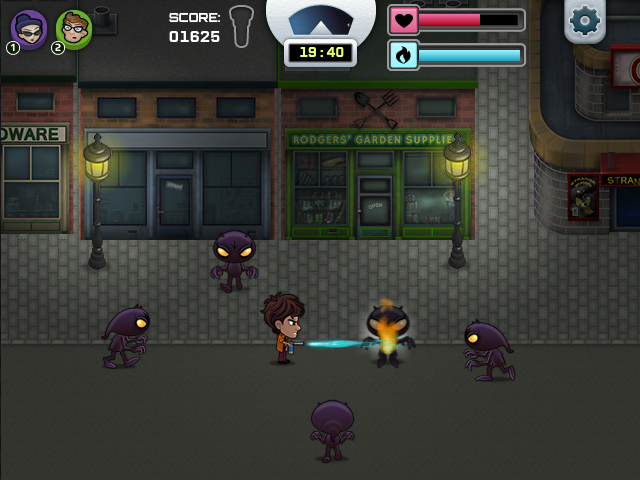 Than you’ll Love Strange Invasion! It’s fresh on the Addicting Games website, give it a play and tell me what you think. To round off with a bit more comic-based news, my May deadline is because I have a table booked at The Bristol Comic Expo! There I shall be selling issue 2, hope off the press, I’ll see you there!